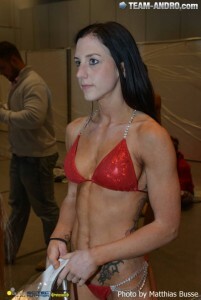 And she's still getting bigger...check her last competition. It's almost scary this lady hasn't peaked yet. "You don't like it black? Ok, next year I'll return being blonde...and a tad smaller. I'll even compromise on paper." One of my favorites. You can see this girl (possibly a Bikini/Fitness competitor) almost looks like she's gonna perform a most muscular...you cannot unnotice her wonderful muscle tone. A few more to keep this (lonely) thread going. "Hey, quit staring at my...everything". A flex from time to time doesn't kill anybody. back stage photos are always very interesting . Do you know her name, please? Some more pictures. I'll have to update my folder, since I'm starting to run out of these. Enjoy. I had almost forgotten about this thread...it's time I put some life on it. We have our bikini Champion. Yes, I do post bodybuilders too. A few more. Enjoy those who like the subject. Britt Miller looked awesome even relaxed. "Watch the hair, buddy!" Awesome. A few more of these pictures. Searching for them is half the fun, since most of the times I don't speak their page's language. Elena Shportun can't wait ot get onstage. Natalie Foureau, proud of her magnificent proportions. The very definition of musculature. Pick any number, and I'll buy it for you. Sorting them...is a whole different story. Best thread ever! All those candid shots! And the girls are smiling! What a treat. I like the weigh in lines because I know which competitor is either physique or bodybuilding. First batch of the year. "Who needs oil and a stage...?" Yep, that's Melissa Geimer's...angel. And this is what she gets when she prays to Him. I love when Bikini girls pose like fbbs. "Yes, miss, sign here, here, and here...and in these other 250 pages, please": Amanda Dunbar, in a full display of her huge lats. On the background, Kristy Hawkins, relaxed...and still looking enormous. These are some of my favorite pics!!! Karma!!! Some more too keep the thread going.